Collect 8 loyalty stamps to receive a FREE £25 gift voucher. One stamp per visit when £35 or more is spent. 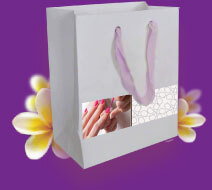 Gift vouchers valid for 3 months from issue. Courses are excluded from this promotion. And you will BOTH receive a FREE gift when a treatment is booked. 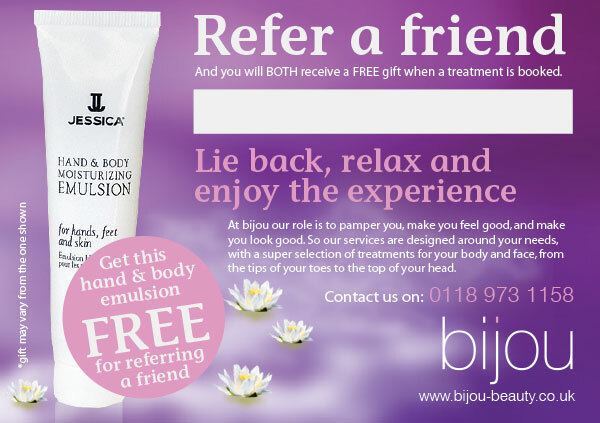 At bijou our role is to pamper you, make you feel good, and make you look good. So our services are designed around your needs, with a super selection of treatments for your body and face, from the tips of your toes to the top of your head. Get this hand & body emulsion FREE for referring a friend.